If your climate is right, edible cacti and succulents are extremely low-maintenance plants and delicious, too! Some people ask what the difference is between cacti and succulents. The definition of a succulent plant is one that has “thick, fleshy, water-storing leaves or stems”, so technically a cactus is a succulent. But most people use the term cacti to mean succulents with spines on them, and all true cacti belong to the plant family Cactaceae. All true cactus fruit is safe to eat, but some taste better than others. Some taste best cooked, and most have to be peeled or otherwise have their spines removed before you put one in your mouth! And, of course, everyone likes different things. So it’s advisable to try some of the cactus you’re considering before buying, to make sure you like it and aren’t allergic. 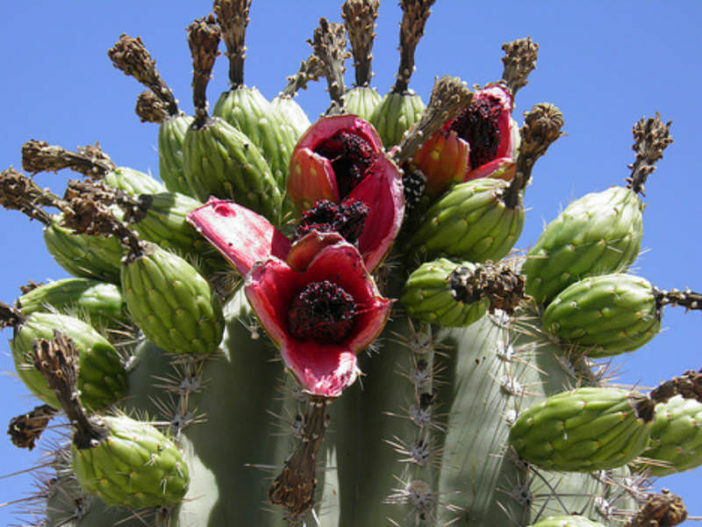 Which edible cactus you choose depends on what you want to use it for and what look you want in your edible landscaping. Many edible cacti belong to one of the 200+ Opuntia species, also known as the Nopales, Nopalitos, the Cactus Pear, or the Paddle Cactus. The leaves and egg-shaped fruit (or “tunas”) of all Opuntia are edible. You can identify Opuntia species by their oval, flat leaves or “paddles”, covered with small spines. The Prickly Pear Cactus (Opuntia ficus-indica) is the most famous and well-loved of the edible cacti. Also called the Indian Fig, their leaves and fruit are very flavorful and are a staple of many dishes in Central America and the southwestern US. This cactus has been introduced into places as varied as Australia, northern Africa, and the Galapagos islands. Opuntia are quite cold-tolerant (growing as far north as British Columbia) and in some places have become invasive, but they have a lot of uses in edible landscaping (they make excellent barrier hedges), and can make a stunning centerpiece in rock gardens or other drought tolerant landscapes. Saguaro (Carnegiea gigantea), the elegant symbol of the southwestern US desert, has edible fruit when it’s fully mature (which can take decades). However, the Saguaro plant itself is difficult to obtain, and is illegal to move without a permit in many areas. If you have one growing on your property, congratulations! The Organ Pipe Cactus (Stenocereus thurberi) resembles a Saguaro but is smaller with “arms” that usually grow at the base of the plant, rather than farther up the main trunk. It has lavender flowers and red fruit known as Pitahaya Dulce, about the size of a golf ball. The Organ Pipe Cactus National Monument in Arizona (US) is full of these, and a visit is a wonderful way to see these lovely cacti in their native environment. The Barrel Cactus fruit can be picked and eaten raw, and has no spines, making it the easiest to handle. The flowers and buds are also edible. One of the legends of the American Wild West was that Barrel Cacti could be cut open and the pulp squeezed for water that would keep you alive in the deep desert. I’ve heard that Barrel Cactus juice doesn’t taste very good but is better than dying of thirst! The vine-like Night-Blooming Cereus (Hylocereus undatus), otherwise known as the “Dragon Fruit” or Pitaya (and also called Pitahaya Dulce in some areas), is a cactus with long fleshy leaves and bright red or yellow fruit with a white or red center and black, crunchy seeds with high nutritional value. The plant has large, fragrant white flowers that only bloom at night. Several species are also called “Night-Bloming Cereus”, such as Peniocereus greggii. 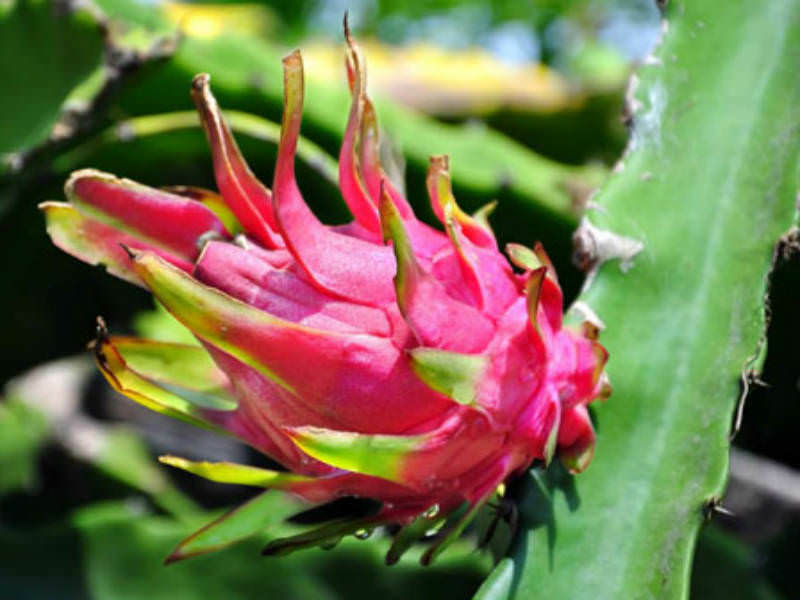 There are other cactus fruits called Pitaya such as from the Peruvian Apple Cactus (Cereus repandus), which looks very different from Hylocereus, but also has sweet, brightly colored edible fruit. Another group of edible cacti are the Epiphyllum species or Orchid Cactus, which look and act much like the Hylocereus species, but their fruit isn’t as large. These all have stunning flowers! A couple of the succulent Caralluma species, Caralluma fimbriata (Caralluma adscendens) and Caralluma edulis, are eaten as vegetables in India and northern Africa. 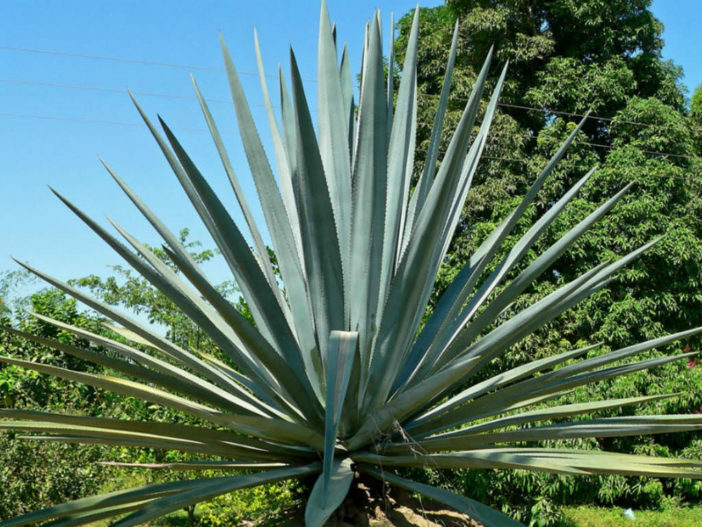 Several species of the Agave succulents can be made edible, the most notable being Agave tequilana which is used in the production of tequila! All of the Sedum species (also called “Stonecrops“) are edible. They are used in salads and are said to have a sour or peppery taste. Eat these sparingly; some can cause indigestion if eaten in large amounts. 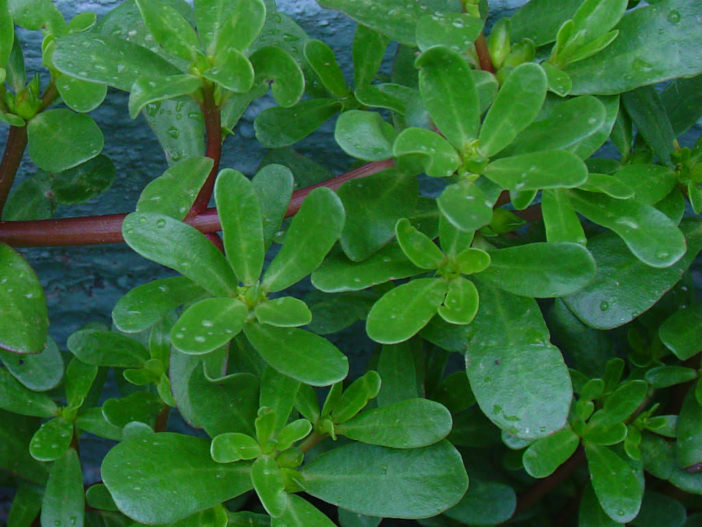 Purslane is my favorite of the edible succulents, being useful as ground cover in moist areas, easy to grow, and quite pretty — not to mention extremely tasty when cooked. In the US, Purslane is considered a weed, but it is excellent in stews and soups, as well as tasty fried and reasonably good in salads.